I’ve made brakes last more than 90,000 miles on my personal vehicle and, as a racecar driver in 24-hour events, kept brakes alive for hours. In other races, I burned the pads almost down to the backing plate in fewer than 50 miles. That was perfect. The events were but 40 miles long. You can make your brakes last a long time or you can wear them out quickly. The choice is yours. Done judiciously, the following money-saving driving techniques won’t clog traffic and few other drivers will notice. If your brakes wear rapidly and these tips don’t help, the problem is with your car, your mechanic, poorly chosen or installed brake parts, or others who drive the car (teenage boy in the house?). The problem could be one of simple geography, if you happen to live in the mountains. Use only your right foot on the brake pedal. 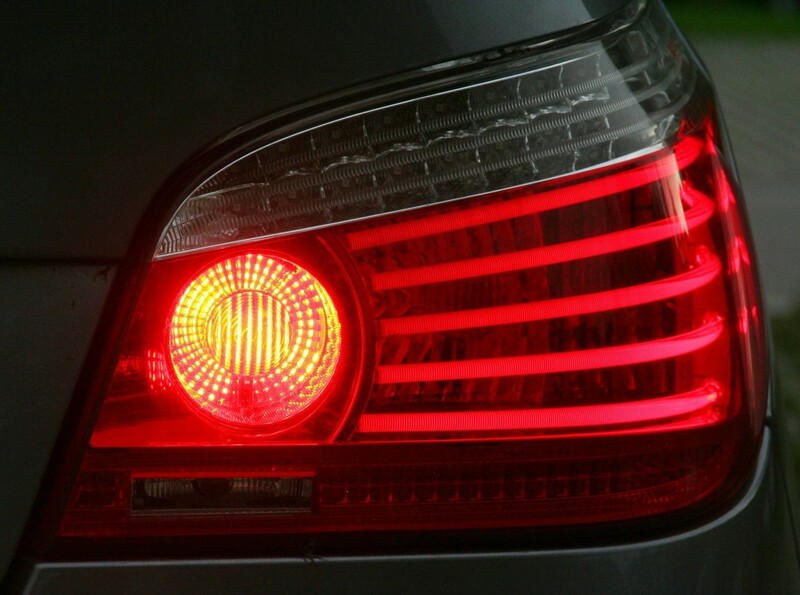 I often see cars cruising at a constant speed — or accelerating away from me — with brake lights either constantly illuminated or glowing like lonely lightning bugs. By braking with only your right foot, you’ll avoid simultaneously pushing both pedals. Also, it’ll be easier to resist unnecessary brake taps: That left foot wants in on the action. A confession: Like a majority of race drivers I sometimes brake with my left foot, but only in short races or during maximum-effort testing. More than one racecar mechanic has installed a panel between clutch and brake pedals in an effort to make the brakes last as long as the race. Coasting is a surprisingly easy way to get rid of a lot of brake-killing speed. During one 24-hour race, a brake failure forced me to drive about 45 minutes without touching the middle pedal. I quickly perfected the art of coasting. If you know you’ll have to stop at the end of a freeway off-ramp, coasting from 70 down to 50 before you brake will significantly reduce brake wear. Time lost will be little or, if cars are queued ahead, none. Memorize places where other drivers inappropriately slow down. Examples include hills which come as a shock to people who have been driving that same road for 10 years, and gentle freeway bends that many mistake for hairpin turns. Often, you’ll have to coast down to their pace. Plan ahead and you might be able to change lanes around them. They’ll re-pass you on the next downhill or straightaway, but you will have used less brakes and gas. Look far enough ahead and you’ll be able to correctly time stoplights, notice traffic backing up or see cars slowing on an incline that’s just become visible. Look beyond the next traffic signal; check out the one after that and, in urban situations, the next and the next. To test how far ahead you look, draw a thin line at eye level on your windshield with a dry erase marker. On level roads, keep your focus above that line and use peripheral vision to position the car within your lane. Then erase the line before a cop asks you why it’s there. Many drivers brake just because the guy in front did. And the first driver touched his brake for no good reason. It’ll take a bit of practice to learn to coast when others brake inappropriately, especially if you weren’t looking far enough ahead. Don’t carry unnecessary stuff. Math majors will point out that this won’t make a big difference unless you’re hauling those barbells you keep forgetting to drop off at Goodwill. However, some aftermarket parts — especially tires and wheels — can add a lot of weight. More significantly, consider vehicle weight before your next purchase. A heavier vehicle is harder on brakes. And tires. And gas. Brake fluid needs to be periodically changed. In mechanic-speak it’s called bleeding and flushing. Renew your brake fluid, especially if you have an older vehicle or one you purchased used. You gain nothing if you save brake material but the insides of the system rot away. Flushing the brake fluid will make the internal components last longer and the brakes work better. Brake fluid naturally attracts water. In an emergency stop or after repeated brake applications, this moisture boils and severely reduces braking effectiveness. Moisture also promotes internal corrosion, which ruins critical rubber seals. Some vehicle manufacturers recommend renewing brake fluid every couple of years. While some mechanics challenge its cost-effectiveness, brake bleeding is an inexpensive, easy task for a do-it-yourselfer. Don’t complain if bargain brakes wear out quickly, but don’t expect the most expensive pads to last forever. Today’s brake pads are extremely complex. They may contain a dozen or more components, and are designed for specific uses. Brake material that best survives heavy-use, high-heat situations may perform poorly for drivers who emphasize economy. A good mechanic or auto parts store should be able to match your desires with the right brakes.